When Save the Children first invited me to contribute some frugal recipes for the Live Below the Line challenge, I knew immediately I had to get involved. Trying to eat good food on a budget is what I’m all about after all. But as soon as I started pulling together possible recipe ideas, it dawned on me this was going to be really rather difficult. People taking part in Live Below the Line are getting sponsored to live below the poverty line on a measly £1 a day for five days from Monday 29 April to Friday 3 May. That’s just £1 for all their food and drink. No foraging or gifts allowed. £1 wouldn’t buy you a cup of coffee in your average cafe. It’s harsh, but it’s also the reality 1.4 billion people around the world wake up to each and every day. Everyone taking part in Live Below the Line for Save the Children will be doing their bit to raise awareness of the plight of people facing extreme food poverty, while raising vital funds to help change the lives of vulnerable children everywhere. Save the Children has challenged food bloggers to devise dishes that cost less than 40p to make from scratch. Every single ingredient has to be costed; every grind of salt and every splash of oil. As I was thinking up ideas, it quickly became painfully clear just how difficult it is to eat well on such a low budget. Fresh vegetables and meat are practically out of reach, making tinned and frozen foods so much more attractive. While sliced, white bread might offer virtually no nutritional value, it does has the advantage of being cheap, and fills you up for a short time at least. If you’re going to try to eat anything vaguely tasty or interesting while on the Live Below the Line challenge, as opposed to surviving solely on beans on toast, it pays to cook in bulk to get your money’s worth. Team up with others as it’s pretty much impossible to cook cheaply for one. And plan your meals. For instance, to get the cheapest onions you need to buy a big bag of them. So then you need to plan a whole list of meals to make sure you get your money’s worth. That’s why the three dishes I’ve come up with for Live Below the Line all revolve around onions, oil, garlic and spices to make sure I made the most of them. Coming in at just under 34p a serving, the first of my dishes is a spicy tomato and red pepper soup, flavoured with celery, Worcester sauce and hot pepper sauce rather like a Bloody Mary, but alas without the Vodka. You really couldn’t sneak that in on this budget! I did intend to use Tabasco but found I couldn’t afford that either, so had to find a cheaper alternative. 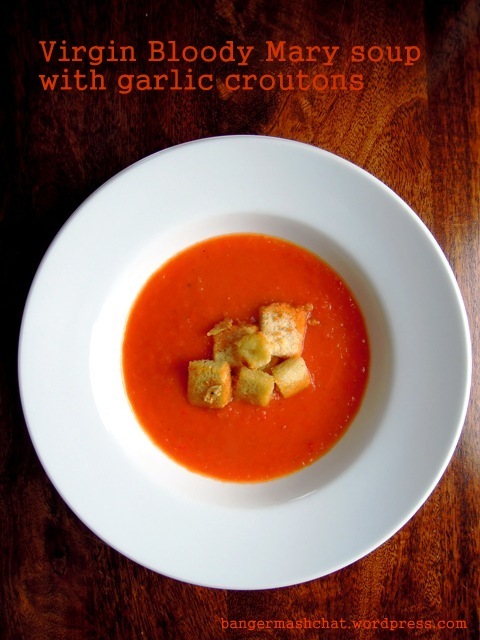 The soup is served with crispy garlic croutons, which I reckon is a pretty good use of cheap white bread, and helps bulk it out. Total cost = £1.35. Cost per serving = 34p. Heat the vegetable oil in a large pan and cook the onion, celery and red pepper until soft. Stir in the chopped tomatoes and vegetable stock. Add a dash of Worcester sauce and hot pepper sauce and season with salt and pepper to taste. Leave to simmer gently for 10 to 15 minutes while you get on with the croutons. Heat 2 tablespoons of olive or vegetable oil in a frying pan and gently fry the garlic until it has just turned golden. Throw in the cubed bread and stir well so all the pieces are coated in oil. Turn the bread out onto a baking tray and cook in the oven for 10 to 15 minutes. When the croutons are looking crispy on the top, use a spatula to turn them over and cook for another 5 to 10 minutes depending on how just how dry and crunchy you like them. 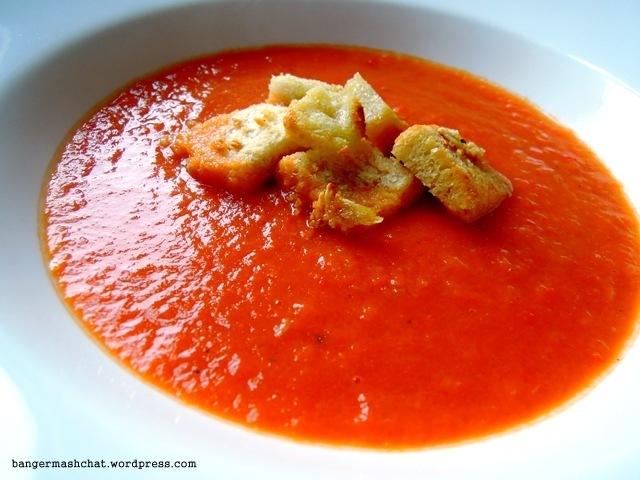 When the soup is cooked, blend in a liquidiser until you achieve a fairly smooth consistency but not completely – it’s good to have a little texture. 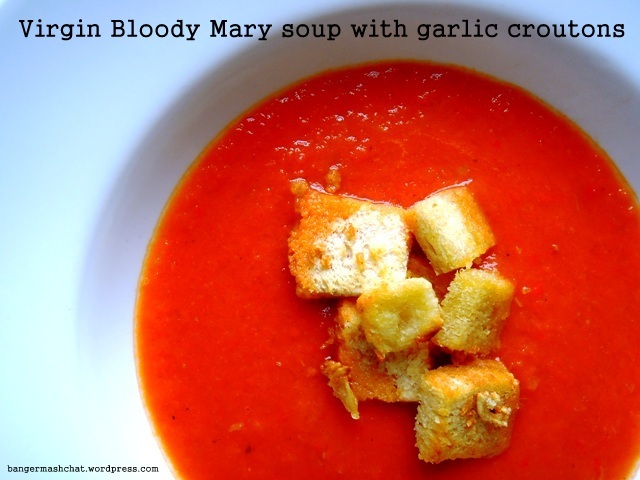 Serve in bowls and sprinkle a handful of garlic croutons on each. Grub’s up! As this dish is so utterly cheap and cheerful, I’m entering it into April’s Credit Crunch Munch, a wonderful blog challenge celebrating the very best in fantastically frugal food. This month it is co-hosted by Helen from Fuss Free Flavours and Camilla from Fab Food 4 All.